Research Interest: Isolation of active compounds from plants, biological activity studies, anatomical and morphological characterization of plants. Biography: She is working as a Assistany Professor, Faculty of Pharmacy Department of Pharmacognosy, Atatürk University. She worked as a Research assistant, Faculty of Pharmacy Department of Pharmaceutical botany, Ankara Universty from 2012-2016. She compeleted her Ph.D in Pharmacy/Pharmaceutical botany, Ankara Universty. She completed her Bachelors degree in Pharmacy from Istanbul University. 1. Bakar, F., Karakaya, S., Delimustafao?lu Bostanl?k, F., K?l?ç, C.S. Anticancer effect of Ferulago mughlea Pe?men (Apiaceae) on cancer cell proliferation. Iranian Journal of Pharmaceutical Research 15(3): 501-504, 2016. 2. Songul Karakaya, Sefa Gözcü, Zuhal Guvenalp, Hilal Ozbek, Hafize Yuca, Benan Dursunoglu, Cavit Kazaz and Ceyda Sibel K?l?c¸The α-amylase and α-glucosidase inhibitoryactivities of the dichloromethane extracts and constituents of Ferulago bracteata roots. Pharmaceut?cal Biology, 56,(1), 18–24, 2018. 3. Songül Karakaya, Hilal Özbek, Sefa Gözcü, Zühal Güvenalp, Hafize Yuca, Hayri Duman, Cavit Kazaz, Ceyda Sibel Kiliç. α -Amylase and α -glucosidase inhibitory activities of the extracts and constituents of Ferulago blancheana, F. pachyloba and F. trachycarpa roots. Bangladesh Journal of Pharmacology, 13 (1), 35-40, 2018. 4. Songul Karakaya, Mehmet Koca, Ceyda Sibel K?l?c, Maksut Coskun. Antioxidant and anticholinesterase activities of Ferulago syriaca Boiss. and F. isaurica Pe?men growing in Turkey. Med Chem Res (2018). 7:1843–1850. 5. Songul Karakaya, Mehmet Koca, Mehtap B. Okuyucu, Ceyda S. K?l?c, Hilal Ozbek, Zuhal Guvenalp, Hayri Duman & Cavit Kazaz. Anticholinesterase Activity of Extracts and Isolated Coumarins from Roots of Ferulago blancheana, F. pachyloba, F. trachycarpa and F. bracteata. (2018).Lat. Am. J. Pharm. 37 (7): 1457-62. 6. Songul Karakaya, Duygu ?im?ek, Hilal Ozbek, Zuhal Guvenalp, Nurten Altanlar, Cavit Kazaz, Ceyda Sibel K?l?c Antimicrobial Activities of Isolated Coumarins from the Roots and Extracts of Aerial Parts and Roots from Four Ferulago Species Growing in Turkey. Iranian Journal of Pharmaceutical Research. Bas?mda. 7. Songul Karakaya, Mehmet Koca, Oksana Sytar. The natural phenolic compounds and their antioxidant and anticholinesterase potential of herb Leiotulus dasyanthus (K.Koch) Pimenov & Ostr. Natural Product Research. 2019. https://doi.org/10.1080/14786419.2018.1557176. 8. S. Karakaya, M.Koca, O.Sytar, B.Dursunoglu, H.Ozbek, H.Duman, Z. Guvenalp, C.S.K?l?c. Antioxidant and anticholinesterase potential ofFerulago cassiawithfarther bio-guided isolation of active coumarin constituents. South African Journal of Botany, Volume 121, March 2019, Pages 536-542. 9. Songul Karakaya, Mehmet Koca, Serdar Volkan Y?lmaz, Kadir Y?ld?r?m, Nur Münevver P?nar, Betül Demirci, Marian Brestic and Oksana Sytar. Molecular Docking Studies of Coumarins Isolated from Extracts and Essential Oils of Zosima absinthifolia Link as Potential Inhibitors for Alzheimer’s Disease. Molecules 2019, 24(4), 722; doi:10.3390/molecules24040722. 1. Karakaya, S., Gö?er, G., K?l?ç, C.S., Demirci, B. Composition of Volatile Oil of the Aerial Parts, Flowers and Roots of Ferulago blancheana Post. (Apiaceae) Growing in Turkey and Determination of Their Antimicrobial Activities by Bioautography Method. Turkish Journal of Pharmaceutical Sciences. 13(2): 51-59, 2016. 2. Songül Karakaya, Hilal Özbek, Zühal Güvenalp, Hayri Duman, Cavit Kazaz and Ceyda Sibel K?l?ç. Identification and Quantification of Coumarins in Four Ferulago Species (Apiaceae) Growing in Turkey by HPLC-DAD. J Pharm Sci Exp Pharmacol 1:35-42, 2017. 3. Songül Karakaya, Fatmagül Del?mustafaoglu Bostanl?k,Gamze Goger,Betül Dem?rc?,Ceyda Sibel K?l?c. Comparison of essential oils and antimicrobial activities of Ferulago mughlae Pe?men (Apiaceae) growing in Turkey. Journal of Research in Pharmacy. Bas?mda. 4. Songül Karakaya, Gamze Göger, Fatmagül D. Bostanl?k, Betül Demirci, Hayri Duman, Ceyda Sibel K?l?ç. Comparison of Essential Oils of Ferula orientalis L., Ferulago sandrasica Pe?men & Quézel and Hippomarathrum microcarpum Petrov and Their Antimicrobial Activity. Turkish Journalo Pharmaceutical Sciences. Bas?mda. 3. Songül Karakaya, Fatmagül Del?mustafaoglu Bostanl?k,Gamze Goger,Betül Dem?rc?,Ceyda Sibel K?l?c. Comparison of essential oils and antimicrobial activities ofFerulago mughlae Pe?men (Apiaceae) growing in Turkey. Journal of Research in Pharmacy. Bas?mda. 4. Songül Karakaya, Gamze Göger, Fatmagül D. Bostanl?k, Betül Demirci, Hayri Duman, Ceyda Sibel K?l?ç. Comparison of Essential Oils of Ferula orientalis L., Ferulago sandrasica Pe?men & Quézel and Hippomarathrum microcarpum Petrov and Their Antimicrobial Activity. Turkish Journal of Pharmaceutical Sciences. DOI: 10.4274/tjps.77200. 5. Songül Karakaya, Fatmagul D. Bostanlik, Ceyda Sibel K?l?ç. Identification and Quantification of Prantschimgin and Felamidin in Ferulago mughlae Pe?men and Ferulago sandrasica Pe?men & Quézel in Turkey by HPLC-DAD. Preventive Medicine Research. 2018. 6 (2), 1-11. 6. Songül Karakaya, Mehmet Koca, Duygu Simsek, Fatmagül Delimustafaoglu Bostanlik, Hilal Özbek, Ceyda Sibel Kiliç, Zühal Güvenalp, Betül Demirci & Nurten Altanlar. Antioxidant, Antimicrobial and Anticholinesterase Activities of Ferulago pauciradiata Boiss. & Heldr. Growing in Turkey. Journal of Biologically Active Products from Nature, 8 (6) 2018 pp 364 – 375. 7. Songül Karakaya, Gamze Göger, Fatmagül D. Bostanl?k, Betül Demirci, Hayri Duman, Ceyda Sibel K?l?ç. Comparison of the Essential Oils of Ferula orientalis L., Ferulago sandrasica Pe?men and Quézel, and Hippomarathrum microcarpum Petrov and Their Antimicrobial Activity. Turk J Pharm Sci 2019;16(1):69-75. 8. Songül Karakaya, Fatmagül Delimustafao?lu Bostanl?k, Gamze Gö?er, Betül Demirci, Ceyda Sibel K?l?ç. Comparison of essential oils and antimicrobial activities of Ferulago mughlae Pe?men (Apiaceae) growing in Turkey. 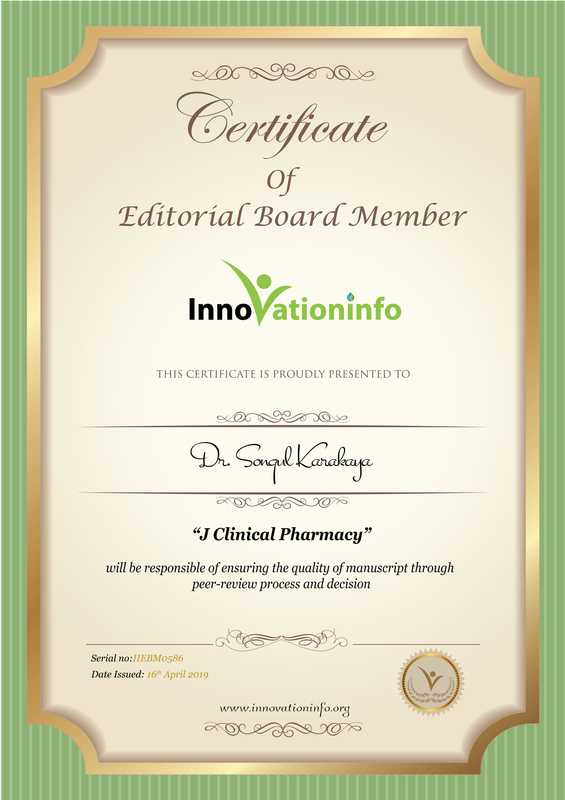 Journal of Research in Pharmacy. 2019; 23(1): 76-82. 9. Songül KARAKAYA, Fatmagül DEL?MUSTAFAO?LU-BOSTANLIK, Didem YILMAZ-ORAL, Serap GÜR, Ceyda Sibel KILIÇ. Effect of aerial part and root extracts from Ferulago mughlae Pe?men and Ferulago sandrasica Pe?men & Quézel growing in Turkey on erectile dysfunction in streptozotocin-induced diabetic rats. J Res Pharm. 2019; 23 (2): 235-241.